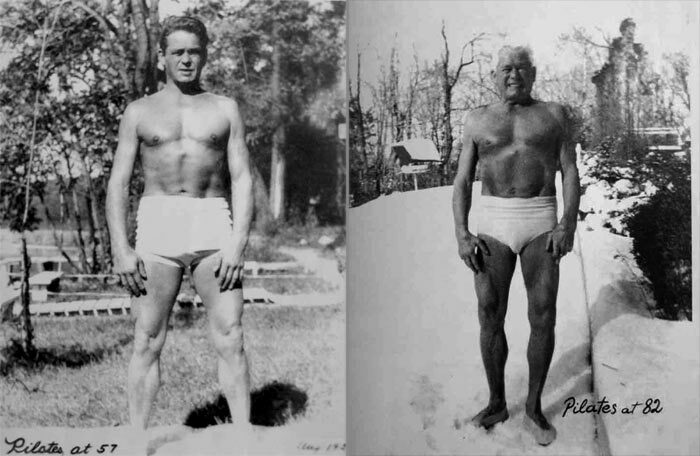 Joseph Pilates was born in a small village near Düsseldorf, Germany in 1883. His father was a prize winning gymnast and his mother was a naturopath. In his early years, Joseph was interested in and influenced by both Western and Eastern forms of exercise, including yoga. He achieved some success as a boxer, a gymnast, a skier and a diver. During WW I, he taught wrestling and self defense. Joseph came in contact with many soldiers who had suffered from various injuries during and following the war. He devised spring mechanisms attached to beds to aid in rehabilitation and so began the development of what we refer to today as the Cadillac. His system focused on the core postural muscles which help keep the body balanced and which support the spine. The central aim of Pilates is to create a fusion of mind and body so that movement is efficient, balanced and graceful. Joe and his wife, Clara, opened a gym following their arrival in New York in 1926. The gym was located on Eighth Avenue in the same building as several dance studios and rehearsal spaces. Joseph began to work with the dancers, eventually including such luminaries as George Balanchine, Martha Graham and Jerome Robbins. Many of today’s Pilates teachers have a background in dance. Clara continued to teach Pilates and run the studio after Joseph’s death in 1967. One of their disciples, Romana Kryzanowska, later took over the studio and moved it to 56th Street. The first generation teachers are often referred to as the “elders.” Romana trained Bob Liekens who later became an extremely well known and highly regarded teacher and is now associated with Power Pilates. In 1989, Dr. Howard Sichel and Phoebe Higgins opened a chiropractic office next door to the studio. This was the connection that led to meeting Susan Moran and eventually the development of Power Pilates. In just 80 years, the number of people practicing Pilates worldwide is estimated to be near 15 million with over 15,000 instructors. In recent years, Pilates has entered the mainstream of health and wellness. Today, more than ever, Pilates is far more than a collection of exercises. It is, rather, a living discipline that continues to be developed and refined through constant use and observation.